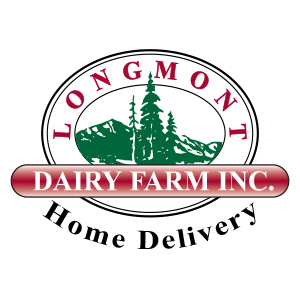 Longmont Diary customer Beverly Trbovich recently shared her recipe and homemade caramels with us. Thanks, Beverly, for sending our office some samples! Delicious! Makes 3 pounds (about 88 caramels). Butter sides and bottom of glass baking dish. Set aside. In this order: melt butter in heavy pan, then add light corn syrup and sugar. Boil over medium heat, stirring constantly, until bubbles are thick and heavy. Add one cup of cream gradually. Try to maintain a bubbling action in candy. Add remaining cream, one cup at a time, as before. When candy is thick and heavy, after last cup of cream, the candy thermometer should read 144°. I prefer the old fashioned way of testing. In a cup filled with cold water, drop a quarter-size drop of caramel from your mixing spoon into water. 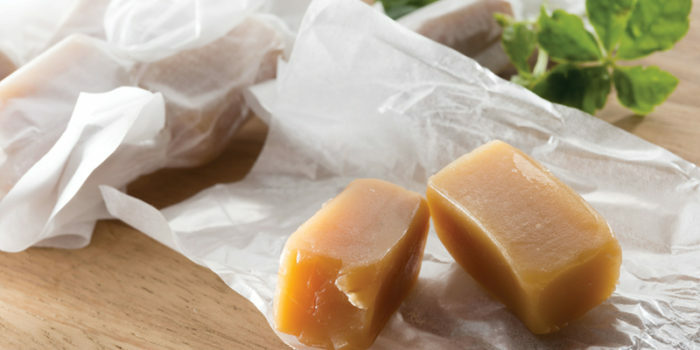 Gather caramel with fingers—you should be able to form a firm ball if it is ready. When ready, quickly take from burner, stir in vanilla, and pour into prepared glass baking dish. Do not scrape the pan to get all the caramel out; the air has already cooled the small amount of caramel left, and it will have a harder texture than the smooth-textured caramel already in the glass baking dish. Let set in cool part of kitchen—not refrigerator—for 8-12 hours. Mark, cut, and wrap. Twisting wax paper is stronger to twist, but parchment or regular wax paper can be folded around candy.